Service desks have at least one section accessible to persons who use a wheelchair or scooter. This section is no more than 28" above the ground and has knee space and open space around it to maneuver. Self-checkout kiosks are wheelchair accessible for those who want to use them. However, the primary method of checking out materials is at the circulation desk which is always staffed to assist anyone who does not wish, or is unable, to use them. The two storey Main Library has a passenger elevator. Beaty Branch is all on one level. Computers are installed with the option of a range of heights. Book drops are accessible height and are operable using one hand. Clearances between and at the end of the stacks are enough to accommodate a wheelchair or scooter (43.25"). Security gates are 37.5" apart. Lighting at book stacks provides a minimum of 20 ft-candles. Acoustic quality is free of unnecessary background noise. 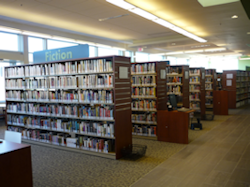 Many of the resources available at the Milton Public Library are suited to accessibility needs. 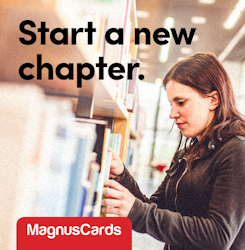 The Milton Public Library is proud to support MagnusCards, a free app created specifically for those living with autism. MagnusCards combines structured, step-by-step guidance with game design to help teach a variety of life skills through free downloadable Cards Decks. As part of our support, Milton Public Library has funded unique Card Decks that will help those with autism or other cognitive special needs feel welcomed and empowered when using the library. Learn more about MagnusCards and get the app.